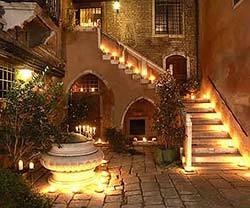 The Palazzo Odoni is the real deal: a 15th Century Venetian Gothic palace with its own courtyard and wellhead. The owners, a family who have lived in the palazzo for five generations, have turned their palazzo into a 10-room boutique hotel. On the tree-lined side of the Piazzale Roma, look for the central path that leads toward the water. A canal is just beyond the trees. Continue straight ahead over the stone footbridge. Follow the curving path through the greenery on the other side of the bridge and continue just past the Hotel Papadopoli Venezia to a small bridge over the Tolentini Canal. Cross the bridge and turn right onto the Fondamenta Tolentini. Walk to the next corner. At the corner, turn left onto the Fondamenta Minotto. The Palazzo Odoni is a few doors down at no. 151, facing the canal. Take a free shuttle bus (if available), a taxi, or the People Mover just outside the port gates to the Piazzale Roma. As you leave the station, turn right and walk toward the modern Calatrava Bridge (a.k.a. the Ponte della Costituzione). Bear left and follow the directions above.